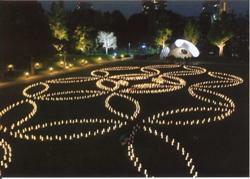 Embassy staff, in response to the initiative of Tama University, made drawings for several Washi candle lights, enriched with slogans and messages of support to the people of Tohoku region. 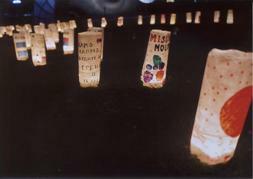 Washi candles were exposed at Tokyo Midtown Washi Candle Event along with many others, showing the magnitude of support and friendship coming deeply from the hearts of the entire international community. The screening of the movie "Underground", made by famous Serbian director Emir Kusturica, is being held in the "Theater - N" in Shibuya, from September 24 to October 21. (Screening times: 13:20, 16:40 and 20:00). 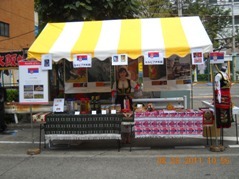 Embassy of the Republic of Serbia participated at the fourth Oi Festa "Shinagawa International Exchange Festa" held on 28 August 2011 in the vicinity of the Oimachi station. 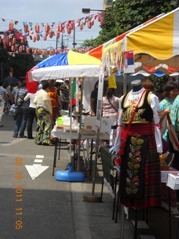 Oi Festa was organized and supported by Shinagawa municipality, Shinagawa Kanko Association and Shinagawa-ku International Friendship Association. The Embassy of Serbia participated for the first time at this celebration and had the opportunity to present to the Japanese public beautiful landscapes of Serbia, traditional Serbian arts, as well as characteristic national food products. All visitors, along with representatives of other embassies located in Shinagawa municipality, enjoyed friendly and festive atmosphere during Oi Festa. On May 15, upon completing his mission to Japan, Ambassador Ivan Mrkic has returned to Serbia. On May 14, First Counsellor Mrs. Snezana Jankovic has also finished her term and returned to Serbia. Before leaving, both of them expressed their deep satisfaction for having served in this beautiful country with its great nation. Following devastating Tohoku-Pacific Ocean earthquake and tsunamis, that took lives of thousands and left milions people in need with grave consequences to the regions of Tohoku and Kanto, the Government of the Republic of Serbia as well as countless associations of Serbian citizens offered donations totaling more than two million dollars through the Red Cross of Serbia. This was also accompanied by numerous humanitarian actions and initiatives in Serbia as a support for Japan, undertaken by Serbian people, various non-governmental groups, private companies and local institutions. The Serbian leadership, headed by President Mr. Boris Tadic, also sent the letters of condolences to the Japanese nation and its Government. 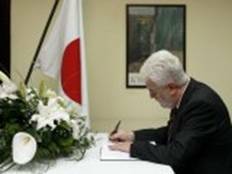 On March 16-18, President Tadic and Prime Minister Mr. Mirko Cvetkovic, Deputy Prime Minister Mr. Bozidar Djelic and Foreign Minister Vuk Jeremic signed the condolence book displayed at the Embassy of Japan in the Republic of Serbia.